UPDATE: When this article was written in May 2014, Apple’s stock price was $84.65. Today (Dec 2017) it sits at a comfortable $176.67. If you’ve followed the tech news recently, you may have heard Fred Wilson’s comments about Apple. In essence he believes Apple is too reliant and rooted in hardware, and that hardware isn’t viable in the long term. Mobile hardware, is becoming a commodity. To be sure Androids have come a long way, and they may yet improve a lot by 2020 as Fred says. But the aftermarket value of iPhones really does speak volumes. See below. If you’ve ever watched a Samsung ad, or talked to someone with the phone you probably know this already. Bigger screens, faster processors, first phones with fingerprint readers, or untethered syncing. The list goes on and on. Yes Apple is rooted in the hardware business, but not in a way that a commodity can disrupt it. They’re rooted in the hardware business only in as much as it helps them deliver polish. If it helps them deliver a seemless experience, and a device that Jean Luc Picard would appreciate, then they are in that business. . Just “make it so!”. So how is it possible that an inferior piece of hardware could sell more? Easy. Those users don’t think that way. They aren’t buying hardware. What do I mean? I would argue many iPhone users buy for the experience, the simplicity, the ease of use. Designers call this User Experience or User Interface, but end users don’t know these terms. What they know is they don’t have a headache. They’re not frustrated trying to move an image from one app to another, or copy/pasting etc. User interface is that invisible force that just makes everything on the device better. Call it polish, but it’s much more than a pretty face. Another benefit touted on the Android side is it being “open”. The OS is open-source, and then extended by manufacturers. While this surely brings down costs to them, it may be all be irrelevant to end users and consumers. Yes open standards are great for competition, great for markets, and ultimately great for users. But Microsoft is a great case study in why consumers often still choose a closed solution. Read: Do managers underestimate operational costs? That may sound fanboyish, but seriously. Look at the accessories market for blinging your phones. If that’s not enough, look at the aftermarket value. iPhones retain their value, Samsung’s don’t. From where I’m standing, and a lot of experts agree, the Android ecosystem is broken. For one the AppStore, being historically unregulated, is chock full of malware and dangerous downloads. Most users aren’t computer experts, not good at evaluating security risks, and pay the price. What’s more many Android phones come stocked with bloatware, slowing down the device, and reducing reliability from day one. Context is clearly important here. Fred Wilson is talking about “top tech companies”. Almost everything Apple does is exclusionary by choice. They are specifically targeting high-end, high-value users. And they have already captured most of that market share. If the world gets another billion Internet users in the next 5 years, those users will be using FB and Google products (possibly even MS products). But the Apple products will be simply unaffordable (by design). Hardware, simplicity, design, etc. All of that stuff is meaningless because new internet users simply can’t even _choose_ Apple. It’s jut not an option at current price points. Given the Context is 5+ years with growth in Internet access and Apple maintaining their exclusionary status, then Apple is simply _not_ going to be in the top 3 or 4 companies. And Apple is proving this themselves as they are doing stock buybacks in an attempt to give back investor money. That’s a clear sign that they have peaked. They had access to nearly infinite money for a couple of years and could not do anything with it. Thx for the comments Gaetan. Exclusionary by choice, that’s an interesting point. While I don’t disagree that Apple has peaked or is close to that, does that necessarily mean they’ll slip out of the top 3 or 4? Time will tell I guess. Apple is doing great system on a chip work that reduces power usage and increases integrated functionality. Who is doing better at that? Vertical integration means they can introduce new hardware, like better GPUs, or new protocols like ibeacon, and have the software make use of it and have it pushed to all users. 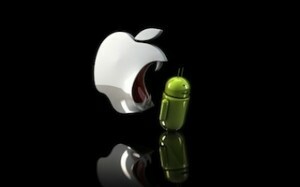 The fragmentation of android makes that impossible. So I can’t see a point where someone on the leading edge will be commoditized like PCs were. Good points Todd. We’ll see how this evolves a bit more on September 9th. Previous PostPrevious Is Dave Eggers right about the risks of social media?